Where does the Jatzu come from? What is She Like With Children And Other Animals? Shih tzu Japanese Chin mix is a small mixed dog bore out of the crossing between a Japanese Chin and Shih Tzu. This animal has talents in watchdog and can live an average of 12 to 15 years. This mix cross dog is not a common dog to find around you. They are friendly and cheerful and prove to be a bit mischievous at times. The simplest way to determine the temperament of mixed breed like Shih tzu Japanese Chin mix is to look up all breeds in the cross and you get to understand the combination of the characteristics displayed in each breed. At the end of this article, you can decide if this Shih tzu Japanese Chin mix dog breed is great for you. The Jatzu is a designer dog, that was created to satisfy the dire need of mixed dogs that potrya certain characteristics over the last three decades or so. 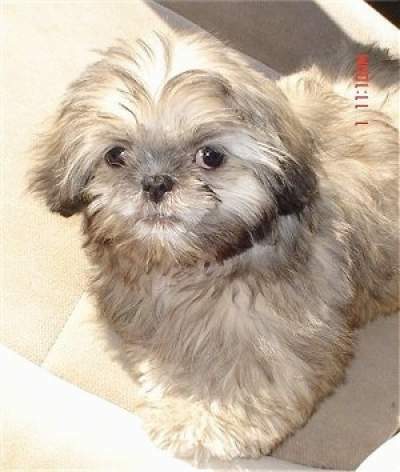 Generally, these mixes like Jatzu has a name that mixes part of the parent names together “Ja” from Japnese and “tzu” from Shih Tzu. Although some people call them mutts, they are not mutt (there is a big difference between them). These are carefully bred with care and thought. However, its disheartening that not all designer dogs are equal. The dog breeding world has witnessed lots of irresponsible breeders and puppy mills who have seen this trend and joined to make lots of money. Cashing out is their only concern and not their dogs well-being. The result is a dog without origin, so we look to the parent breeds to have a better feel for the mix. Always keep in your mind that there are not really any guarantees as to how these puppies come out in the way you pictured it. Anything could come in from either parent in any combination. Do not be shocked if the same litter show a great deal of difference between siblings. Although the name suggests these dogs originated from Japan in fact they come from China. According to history, the dog was gifted to the then emperor of Japan where he was crossed with smaller dogs and grew to become the breed we are now familiar with. In Japan, he was not seen as an ordinary dog (inu) but as being his own (Chin) thus the name. Large parts of the world had not seen them until international trade in 1953. It was during this period that dogs were imported to places like Britain and the US. 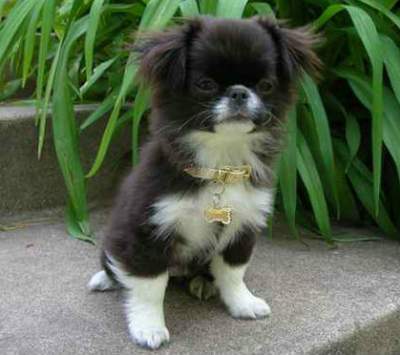 The Japanese Chin is a happy and charming dog. He/she is smart and will chat to you but is not totally yappy. He is affectionate and sensitive and can adapt quickly to his surroundings so if he lives in a quiet home he is quiet too, if he lives in a fun house, he’d be more lively. Because he bonds so deep with his owners he might suffer from separation anxiety when left alone. He can also be shy around new people. Coming from Tibet or China, this is an old dog breed that was viewed as companion dogs. Popularly called little lion dogs, they were gentle, intelligent, and cheerful. It was not until the early 20th century that a breeding pair arrived in England and was bred there. In 1928, he was recognized by the Kennel club in GB and the American s recognize him as a breed in 1959. Today, the Shih-Tzu is still much a friendly companion dog. He wants to please and love to be with you. He loves getting and giving affection too. He will spend as much time as he can in your lap and is a happy little dog when he gets lots of attention. He can get lively real quick and love to play. The Jatzu is a social, friendly, and playful dog always mischievous and cheerful. She is an affection giving and seeking dog and will be very loving to her family. She can be loyal and is also at alert for danger. She can also be sweet, gentle, and loves to be the center of attention. She is even tempered and loves to please her owners. She does not handle being left alone for long periods as she wants to be with you. She is a great companion dog. She is a small dog with an height of about 11 inches tall and weighs 8 to 20 pounds. She has a straight fur and floppy ears. Her coat is thick, fine, silky, and fluffy plus its common colors include black, golden, cream, white, brown, and apricot. Her body is kinda muscular but well-proportioned and she has a small dainty feet. How Active Does The Jatzu Need To Be? She is not too active and so will need frequent exercise outside as well as her play time inside. A couple of walks a day would be a great start, occasional trips to dog parks too wouldn’t hurt her. She is great at living in an apartment due to her size but to be healthy and happy she does need time outside on daily basis. If there is a yard for her play in though that is a bonus. She is fairly easy to train as she is smart and eager to please. She learns best with positive and gentle methods so while you need to be consistent and firm, you can also use praise, treats, and rewards to encourage her. Some dogs can be stubborn on occasions so be prepared for this type of war. Early training and socialization and training are important to see her become the best dog she can be. The Jatzu is a dog that needs maintenance in moderate amounts. She sheds a fair amount and that will mean you will clean up her hair daily around the house. When her hair is left long, it can tangles easily so brushing daily is needed. It may need frequent trimming or stripping so that will mean going to professional groomers. You have to clean around the eyes too as she can get tear stains otherwise. Bathe her as needed and ensure you make use of a dog shampoo only which will be better for her skin. Nails will require clipping when they get too long and a groomer could fix that. Other needs are having her teeth brushed two to three times a week and checking her ears and wiping them clean once a week. This is an awesome dog for families with children as she play with them on a regular, is affectionate towards them and is a softball. Because of ger size, we wouldn’t really advice you leave her unsupervised with young children who do not know how to play a bit more careful. She also gets on well with other dogs and pets. When showered love, the Jatzu can be a good watchdog and be at alert. She is a quiet dog and barking is rare. She should be fed ¾ to 1 1/2 cups of good quality dry dog food a day split into two meals. There are health issues that her parents could pass to her or that she is more prone to because they are which includes Heart problems, eye problems, Allergies, hip dysplasia, ear infections, Patellar luxation, Legg-Calve-Perthes, bladder and kidney problems, Umbilical hernia, liver problems, snuffles and reverse sneezing. Check out the puppy at the breeders before buying to see the conditions she is in and also ask for parental health clearances. $150-$80 is the average a puppy could cost. Other costs for things like a crate, carrier, collar and leash, micro chipping, spaying, blood tests, deworming and shots which total to $360 to $400. Yearly costs for non-medical essentials like food, treats, toys, grooming, license and training come to between $575 to $675. Yearly basics costs that are medical like pet insurance, check-ups, shots, and flea prevention come to between $435 to $535. Any cute name will do. We prefer one word names like Jay, Mart, n the likes. The Shih tzu Japanese Chin mix can be a good family dog preferably in a home with older children or a companion for couples or singles. She needs owners who can be somewhat active as while she is a great lap dog she does have some energy to burn. She is a mischievous and cheerful dog who is a joy to be around.